Welcome home to your new manor in the countryside! Many of you might remember my airbase from 1.0.5. This map is created in the same style. The base sits in an entirely untouched map on a 1.0.6 world. This means all the new locked chests are there for you to find! NPCs Spawned: All but the clothier. He'll turn up when you kill Skeletron. Hellivator with water landing and hellhome. Cottage shelters with beds at the dungeon and far left ocean. This building is, much like the airbase, a very compact base. I tried to include the detail you see in the more epic structures but keep it to a scale that is comfortable for daily use. 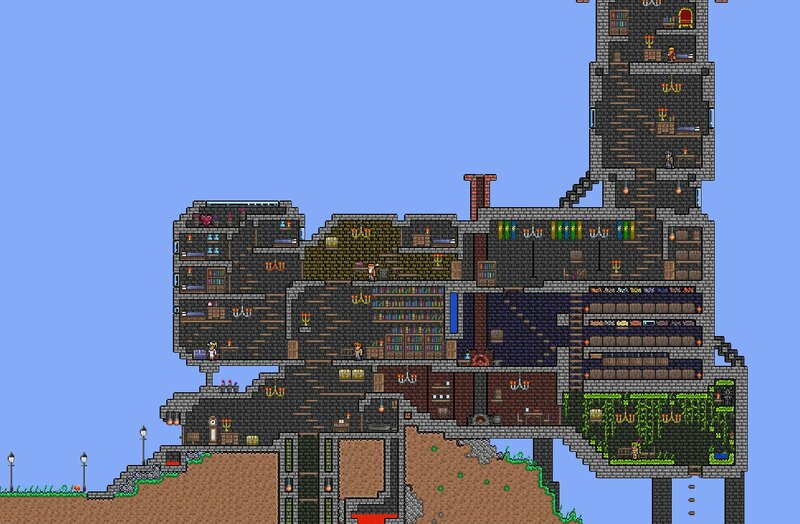 For a version with no items or to give feedback please go to the thread on the Terraria forums. I will see feedback here eventually however I do not check it nearly as often. build a house in the sky reachable only by rocket boots also make it so high up enimes wont spawn ive done this already but i want to see yuors OK?